Drawing animals requires fast thinking and quick execution. Unlike artists of landscapes or still-life, the animal illustrator must adhere to this golden rule: observe much and long and draw quick and little. This respected guidebook, written by renowned wildlife illustrator Charles Liedl, shows you how. In How to Draw Animals, artists of every level will learn the techniques for portraying animals accurately and gracefully, whether the creatures are in action or repose. Keen advice on the importance of visually mastering the subject's anatomy gives way to invaluable guidance on line sketching, outlining, shading, form, tone, and detail. 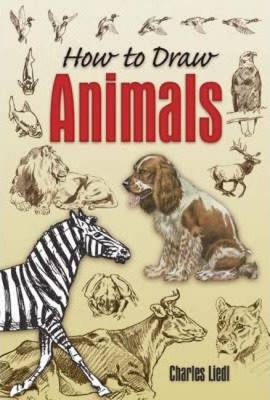 More than 100 expert illustrations include muscular and skeletal characteristics, and detail the development process in creating an enormous variety of wild and domestic breeds: horses, deer, game birds, dogs, cats, rabbits, foxes, buffalo, zebras, tigers, wolves, and many more. The author also provides tips on the best media to use and how to use them, as well as how to guide an animal to turn or resume a pose. A time-honored art instruction guide, both motivational and inspirational, this volume is a must-have for the bookshelves of every artist.